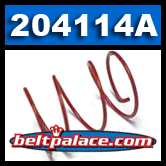 Home > COMET INDUSTRIES BELTS > COMET 200395A Belt. 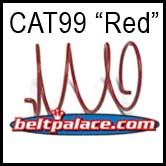 Replaces 993-80 Belt for CAT99 Series > Comet CAT99 "Red" Spring. Comet part 204114A. Comet Industries 204114A. Comet CAT99 "Red" Cam Spring. Comet CAT99 "Red" Spring. Comet part 204114a for 99D6 and 99D7 Driven Pulley. Comet CAT99 CVT Clutch systems are obsolete and no further information is available. We are limited to available stock left on hand, please order what you need now before we are sold out!